This self-assessment tool has been designed to help schools consider the elements recognised in the Preparing Secondary Students for Work framework ("the framework") as underpinning quality vocational education and training (VET) programmes that are valued by students and employers. The tool assists schools in planning, implementing and reviewing VET programmes that result in the achievement of nationally recognised qualifications from industry-developed training packages or accredited courses for their students. It can be used by those with little experience in providing VET opportunities to secondary students or by experienced VET practitioners to help them assess and improve the quality of VET offered to students. Completing the tool will enable you to determine areas for improvement and identify further actions that can support delivery and assessment of VET. The tool will provide guidance on good practice and quality VET and will direct you to additional supporting information based on your responses against each section. This tool is designed to be used by schools and could be completed by principals, teachers, trainers, or VET coordinators. 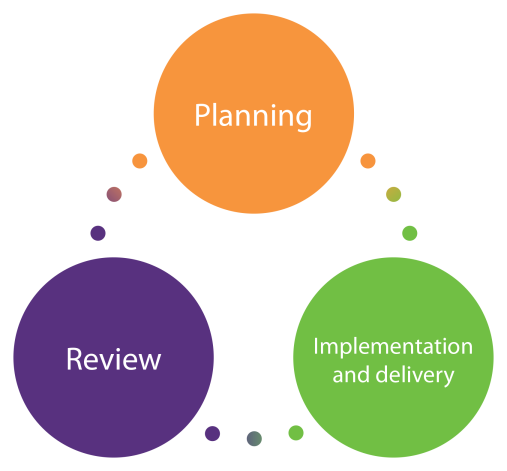 Practitioners developing new programmes should begin with the Planning stage and work through each section of the tool. For existing programmes, you may like to focus on the Implementation and delivery and Review stages and these may be applied to an individual programme or group of VET programmes. It may also help you to explore your existing programmes from a planning perspective. A number of resources designed to assist schools offering VET already exist. These resources cover topics such as programme delivery requirements, school-based apprenticeships/traineeships, as well as best practice for working with employers. The self-assessment tool directs schools to these based on the state or territory and to other relevant resources in a targeted way and provides an analysis of programme areas that require improvement. On completion of the self-assessment, a report will be generated that can be saved to your computer, printed out and shared with others. Information provided on state/territory, sector and the user's role in VET will be captured for reporting purposes. All other information is private and will remain anonymous. Create your user profile below and move through the self-assessment tool at your own pace. Results can be saved using the 'save and continue' button at the top of the screen. You will be prompted to provide an email address and an email link to your results will be sent to that address. Responses can be changed at any point in time prior to generating the Summary Report. Each Summary Report will apply only to the module selected and VET programme(s) you are evaluating. New Summary Reports for VET programmes will require separate assessments. Which option best describes your role in the VET programme(s)? *This question is required. 2. Where would you like to begin? *This question is required.